On Tuesday 1 August 2017, more than 250 young musicians aged ten to twenty will perform on-stage at the Odeon of Herodes Atticus in Athens as part of the Sistema Europe Youth Orchestra's concert to close this year's Hellenic Festival (Athens and Epidaurus Festival) in Athens. 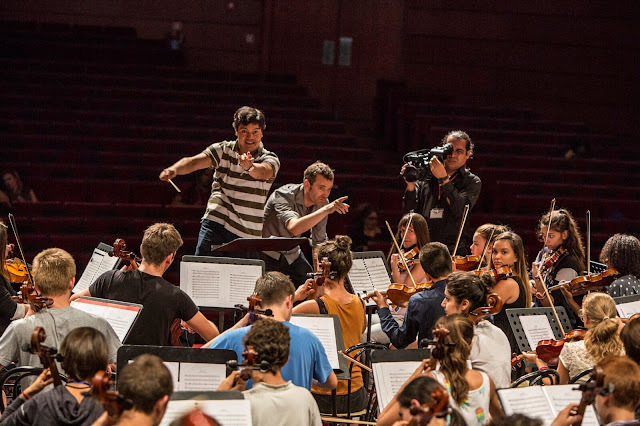 The performance is the culmination of the Sistema Europe Summer Residency, which brings together young people and teachers from 16 countries with Sistema and Sistema-inspired programmes for 'social change through music'. All rehearsals are hosted at the Athens Conservatoire, which supports the project. Conducting the orchestra will be renowned personalities associated with the El Sistema movement: Bruno Campo and Samuel Matus (Guatemala / Austria / Turkey), Etienne Abelin (Switzerland), Juan Carlos Maggiorani, Félix Briceño and Ron Davis Álvarez (Venezuela , Portugal, Turkey / Sweden), and Faidra Giannelou (Greece). The French-Greek composer Alexandros Markeas has written a new piece for the occasion, Taxidi (meaning 'A journey').